Love Harry Potter? Love traveling? Then we have a bucket list for you. This LARP (or live action role-playing) event is about as close as most Muggles are likely to get to being a wizard. The volunteer-run College of Wizardry takes place in an actual castle, which participants live in for a long weekend. “We want the larp to feel like you're stepping into the world of Harry Potter,” the organizers state on the website. Upon arrival, participants—who play students and instructors—receive a wizard robe, a study book, and a tie in their House color. The event, according to the website, “is created by the players and organisers together, with everyone pitching in and helping make the magic come alive.” Registration for the next event, which takes place in April 2015, is now open. This guided walking tour happens nearly every day and takes participants to a number of filming locations from the Harry Potter films, including the entrance to the Leaky Cauldron from Prisoner of Azkaban, the visitors’ entrance to the Ministry of Magic from Order of the Phoenix, the alleyway that served as the inspiration for Diagon Alley, and No. 12 Grimmauld Place, among others. Of course, no Harry Potter fan’s world tour would be complete without a visit to Leavesden Studios—formerly an old airplane factory and runway—where the movies were filmed for over a decade. 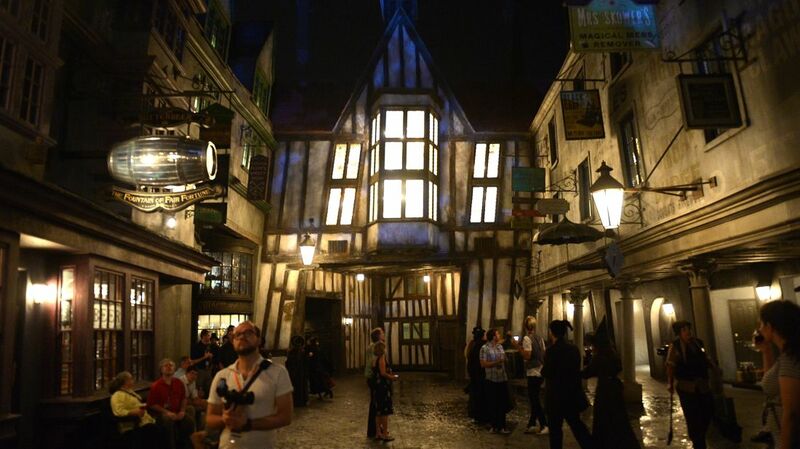 Visitors can hang out in the Great Hall and Diagon Alley, visit the Dursley’s home at 4 Privet Drive, board the Knight Bus, drink a butterbeer, and even hop on a broom against a green screen to take an awesome souvenir photo. Wizards-to-be, of course, ran through a barrier in London’s King's Cross Station to this platform, where they caught the Hogwarts Express to school. Muggles can’t do that, but they can take fun photos with the trolley that’s halfway through the wall and shop in the nearby Potter store, which has some fun exclusives. Memorably, in the Sorcerer's Stone movie, Harry visits the London Zoo with the Dursleys. In the Reptile House, he not only has a conversation with a Burmese python, he makes the glass front of its habitat disappear, allowing the snake to slither free. Potter fans can reenact the scene themselves, but let's hope they don't make the glass disappear: In real life, the exhibit holds a very venomous black mamba. Maybe you never got your Hogwarts letter in the mail; maybe you’re too impatient to wait for it. Either way, staying in the Wizard Chambers at the Georgia House Hotel should scratch that Hogwarts itch. The rooms are furnished in a gothic style with four-poster beds, cauldrons, old trunks, and the Gryffindor crest on the wall. It’s enough to make any Muggle feel like they’re staying in a magical castle. Upon entering this traveling exhibition—currently in Germany—visitors are separated into houses by the Sorting Hat. Then, they’ll travel through rooms with displays inspired by the films’ sets to check out authentic Harry Potter props and costumes. There’s also an audio guide featuring interviews with the craftsmen and women who helped bring this magical world to life. Go back to where it all began with this tour, which starts in Edinburgh. First, travelers will go to the cafes where J.K. Rowling wrote the books; then, they’ll travel Northumberland to visit Alnwick Castle, which acted as Hogwarts in the first two films. The tour finishes up in the Scottish Highlands, where the visitors will visit filming locations and take a steam train that crosses over the Glenfinnan Viaduct (which Potter fans will recognize from Chamber of Secrets—it’s where Ron and Harry have a close encounter with the Hogwarts Express in Mr. Weasley’s Ford Anglia!). Americans looking to get the Harry Potter experience without leaving the continent can head to The Wizarding World of Harry Potter in Orlando, Florida. There, they’ll visit Hogsmeade and Diagon Alley, ride the Hogwarts Express and Dragon Challenge rides, drink pumpkin juice and butterbeer, eat at the Three Broomsticks and The Leaky Cauldron, and shop at stores like Dervish and Banges, Honeydukes, and Weasleys Wizard Wheezes.